My first attempt to locate the place was unsuccessful, partly because it was on one of our EOiD “field trips” to the Jama Masjid area, and frankly there were far too many other interesting places to try out close by. The second time I had rushed there with a friend at about 7:30 in the evening, only to be told that they had already run out of their stuff. The third time my luck was even worse: I had woken up at the crack of dawn, driven my car like a maniac halfway across Delhi and through the back-lanes of puraani dilli, then having lost my way, taken a rickshaw — and on getting there, was told by a worker clearly unused to the idea that someone actually didn’t know their timings, that they open for business only in the evening. This was about as unexpected as a sad ending to a Bollywood film, considering nihari is traditionally a workman’s breakfast, something that at little cost fortifies him for a day of hard labour. So it was with not a little trepidation, and only in the belief that Vinayan would be my lucky charm, that I decided to take yet another shot at Kallu’s Nihari last Thursday, as a prequel to yet another of our field trips. This time, I was there by 5:15pm, and even before we could see the shop itself, a reassuring throng of customers came into view. I wouldn’t have thought it possible, but Kallu’s shop is even more modest than Haji Noora’s in Bara Hindu Rao, with just a small tiled area serving as a place to sit on the floor and eat. Its proximity to the tandoor means that in this weather, sitting inside the shop makes Dante’s Inferno sound like a nursery rhyme. Consequently, most people prefer to find a spot outside, be it the doorstep of a neighbouring house, the window ledge on an unsuspecting wall, or the seats of a parked scooter. Vinayan and I were a little tired from the rather circuitous route we took to get there, so we gladly lodged ourselves on a bench in a small shop next door which Kallu’s establishment seems to use as part-warehouse, part-restaurant. I promptly asked for the larger size of helping of nihari (for Rs. 25 apiece) for each of us, and Vinayan went off to get us some water from another store in the alley. Which as it turns out, was the best thing he did, because Kallu’s nihari is nothing if not hot. The meat is tender enough to flake off at the touch of a roti, but that would be the minimum I would expect from a shop of such stature. The spices in the curry, however, I am in no position to comment upon, because with the very first bite, my taste buds had laid down their weapons and gone into a dead faint. Kallu’s regulars on the other hand, are clearly not so faint of heart, because he now finds it necessary to actually add to the nihari a garnishing of sliced green chillies! Despite my induced gustatory amnesia of the whole event, I am certain the nihari must have been good, because in minutes both Vinayan and I had used the soft, piping hot khameeri rotis to mop up our extra-large plates of nihari to the point of sparkling. That said, I think until I can train my tongue for another battle at Kallu’s, I shall stick to Haji Noora’s stuff, thank you very much. Price: The usual helpings of nihari are for Rs. 15, but you can order the larger size for Rs. 25. Rotis are Rs. 2 each. Timings: 5pm to 7pm daily. The earlier you get there, the better. Update [Sep 7, ’07] Haji Noora Repr(a)ise: Vinayan and I visited Haji Noora’s yesterday morning. I hadn’t been there since last winter, so I’d forgotten just how good it was. We both agreed without any hesitation that the Haji’s nihari beats Kallu’s hands down. This one’s amazing…A trip worth trying on a weekend…Thanks for enlightening…Have been wanting to know how exactly a nihari tastes…but was apprehensive in trying out somewhere nearby. P.S. ur taste buds are at risk of burning at shaberaati’s joint…may b a butter garnishing would help to calm things down..! Nihari bohat kha rahe hain aap ? Kayi logon ki niyat kharab ho rahi hai nihari ke liye aapki descriptions parh kar. Lihaza ham sab ka hissa jald se jald rawana faramayie. warna pet kharabi, acidity, ke zimmedar ham nahi hain? I just saw your Google map with recommendations, it’s great! Thanks Deepa! 🙂 I hope some people find it’s actually useful. Hemanshu thank you so much for writing about Kallu’s Nihari. I am a Pakistani. My grand mother’s relatives lived in the neighborhood you mentioned. I visited Delhi when I was 14 I am now 27. My nani talked about Delhi all the time and she took me with her. To be very honest I didn’t like Delhi. too crowdy, too hot. One day my Nani’s nephew (her brother’s son) took me to Kallu and we brought Nehari in one large bowl. My mother’s Uncle (Mamoo or Mama in Hindi) had his shop right behind the Delight cinema. My grand father (Dada jaan) also came from Delhi he had a large house near chitli qabar. All these people who migrated to Karachi brought Nihari with them among many things. I live near Burns Road which is famous for the for dilli walon kay khanay like Nihari, Haleem, Qulfi, Mithai, etc. My grand parents from both sides are now dead. I never liked them talking about Dilli. They missed their hometown so much and I didn’t like the way they compared dilli with Karachi. I have very fond memories of my grand parents associated with the neighborhood you just talked about. 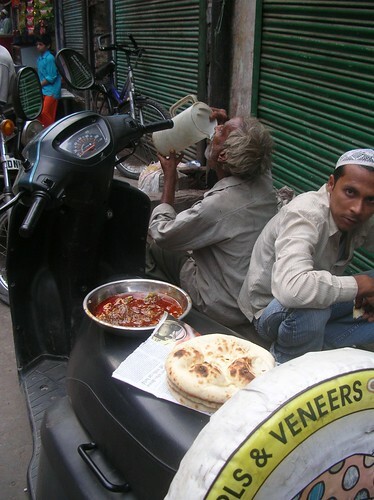 Whenever I read about Delhi, I am reminded that this is the place they came from. This is the place which is alien to me but I am originally a Delhi Wala. (thats how we are known here in Pakistan). Thank you so much once again. Numaan: I have to admit your comment brought a tear to my eye. It’s been many years since you came to Delhi, and it’s changed quite a bit in that time. I hope you’re able to return soon. I’d love to rediscover Delhi together with you. Incidentally, I visited Karachi a couple years ago, and loved the city. I can completely understand how coming from there you found Delhi very hot and crowded. Guys your conversation certainly is thought provoking has eye wetting properties. It makes us realize that no matter how many borders and guns and missiles and what nots come between us, we are nothing more(or less) than families of two brothers who have split after a spat. But with the kind of right attitude and dispositions to wards each other crossing borders would be like visiting chacha’s place. Came to this thread after a while, so was going through some of the earlier comments on this thread, regarding ordering nihari with butter.. Somehow I always have been a bit curious everytime I see you ordering nihari with butter or desi ghee. On our last trip to haji noora’s, I tasted the nihari both with and without the extra dollop of butter/ghee, and seemed to prefer the one without butter. Doesn’t adding butter or ghee mellow down the flavor of meat and spices? What’s your take on this? For all new to the mystique called Nehari. Especially those who think it is bad for the digestion. Actually, all mughlai foods if taken as regularly as we breathe are very deadly for the stomach, liver and other neighborhood organs. For the simple reason that they are extremely spicy and heavy with animal fat. But then if we make a pilot dress like a mine worker, he will not learn to dig but lose his own identity. There so Mughlai food is meant to be that way as thats its heavenly flavour. So the best to do is to have it once a week or fortnightly for those who really relish it. And have a feerni or cold sweet dish follow it close on its heels. There is a place outside Delhi and I don’t recall the name where veg food is prepared simply and served as you sit on the floor. There are exhibits like a cow hooked up to a stone grander, and other things. It was wonderful-wish I could remember the name, but it has been 10 years. I was the only non-Indian and went with friends so I don’t think it is a tourist spot. Kallu’s Nihari is certainly one of the best I have ever eaten. This year, I ate some of them in Iran too, in restaurants run by Pakistani breathrens. 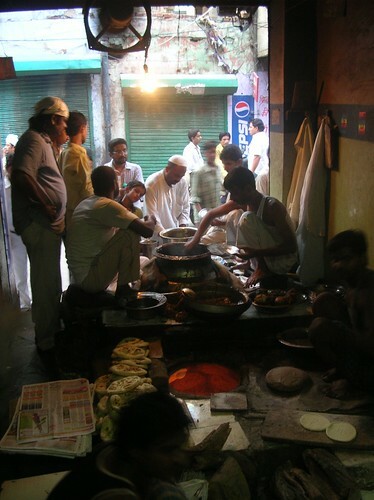 But I still believe Hazrat Nizamuddin’s Monis Qada Nihari is the best that is available here. Try that too once. I am sure, you’ll like it. And yes, this one also serves in the evening. What more, they also serve Chote ka Bheja–a must with Nihari. Haji Noora is one that i havent tasted yet but Kallu’s Nehari and Sarfaraz ki Nehari in the same locality are the ones that i have tried and defntly swear by it…I also disagree on adding butter to nehari as thats not the way its supposed to be eaten.. But my suggestion to all those people who really would like to try the real form of nehari, it has to be eaten at Subzi Bagh in Patna, Bihar…u once try that and i guarantee you that you will go back again for the experience…..
Thou Now next on my agenda is goin down to Haji Noora as i have heard the best reviews of the one served there. For all those people who would like to trip on Nehari at Dawn, try visting Hazrat Nizzamuddin thou the flavor has no comparisons with the ones that are being discussed but its defntly worth a try for breakfast. Does anyone know where good Nihari is available in Mumbai? Ok I can say that I have had my share of nihari: In Houston sabri nihari was very good till they sold it. B4 that sheikh chili’s nihari was the bomb till the old man quit & sold it. I dont like the watery kind of nihari. I was actually introduced to Nihari’s in Dubai. I had never even heard of it in Bombay. Here lately I go to Shanai but the problem is they only make it once a week & I hate the old stuff so you never know when he actually makes it each time I call they never deny that it was not made the same day – So I take my chance sometime I am blessed with great nehari & at other times I want to throw it away coz i caught it at the tail end of the week old basi nehari. Hameed you told me about this kallu nehari lets go together to Delhi & have this authentic nehari & put our taste buds in 9th heaven – Kya bolta hai? Bhindi Bazar area in Bombay.You will be surprised. Just good reasonable food @ very humble place. People who go to Shabrati ki Nihari should definately try his Butter Bheja.He take half a packet of butter ,heats it up in a pan and then put one bheja which in next to his Nihari Degh.He cracks open that shell and puts the bheja in the pan.The combination of Bheja & Butter is do dye for.Guys who har food freaks would fall in love with it. Just an update on Kallu Nihari, the shop remains closed on Sundays as I found out this evening after driving-walking-metro-walking for more than an hour. In Chittagong long time ago, there was a Dehlavi restaurant which used to serve Nehari for breakfast, garnished with fresh ginger (like match sticks) , and hot Nans. Decades have passed but the taste, and sticky fingers still remind me of the Golden days.I want to thank you for your excellent article my friend. Next PostNext Nagpal Amar Rahe!